During World War 2, I was evecuated at 25 Carn Bosavern from 1944-45 and spent the most miserable months of my life there. I was born in Carn Bosavern in 1942, moving to Fore Street 2 years later. I have happy memories of spending time "up Carn" as a child, as my granny still lived there. My parents had evacuees before I was born, mum told me many stories about those years, and how traumatic it was for the children leaving their homes and families. I have very fond memories of all around this area, I lived down Nancherrow, in the house behind the shop that I believe is now a craft /art shop, I left in 54 to live in Australia but now live in New Zealand, my Aunty still lives at Carn Bosavern !!! In the late 1980s I fell in love with St Just and especially Carn Bosavern. Now I live in this row, walk straight along this pathway..... Cottage cold and damp. But bliss!! 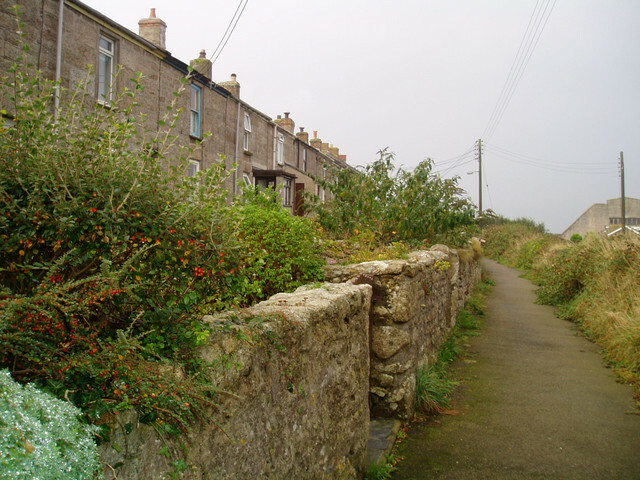 Row of houses is behind Carn Bosavern Garage. St.Just Garage is in Fore Street. I recall in 1940's,50s or 60s Revd.Harry Reseigh who was Minister of Congregational Church in Penzance and lived in St.Just - possibly Queen Street.Also Capt.Joe Reseigh, Master of the "Scillonian" about same period - probably lived on the Islands. evacuee to 16 Bank Square Butchers-then Boscean Farm,the Count House with Matt & Ethel Eddy,From Walthamstow.. Probably the best years of my life. Thank you to the people of St Just. My Gran and Grandad lived at number 52 then 36 Carn Bosavern best childhood days ever. Still researching the period.Believe the name of the road to be Tregeseal...Anyone know of the number and the identity of the residents..The house with the shop at the bottom of the garden..
My father, Marshall K. Smith, was born at 32 Carn Bosavern on 28 June 1915. Trying to reconstruct family tree from 1600 for Reseighs. We are in California. Directly related to Reseigh book of Australia. Visiting area. What do you suggest? I was billeted during ww2 at no. 18 carn bosavern with a Mrs Rowe who had a daughter living in South Africa. The house was situated overlooking what was then the drill hall, where dances were held. My bedroom was at the front and I could listen to the music as I lay in bed. I was friendly with a girl called Adrienne who I think also lived on the carn. My grandparents (Mr and Mrs W J Johns )lived in no 31 many happy hours spent “ up Carn” in the 50s and 60s with the Carners!, good days.